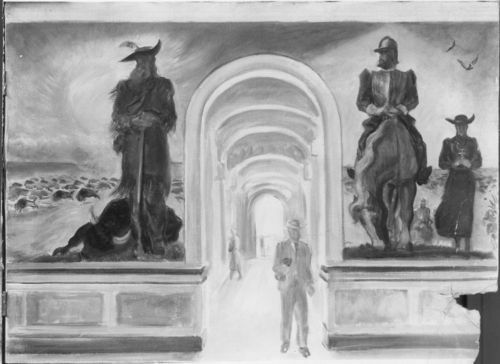 This black and white photograph shows the preliminary sketch for a portion of the statehouse mural entitled "Tragic Prelude" by Regionalist artist John Steuart Curry, (1897-1946). Located north of the archway on the second-floor of the capitol in Topeka, Kansas, the mural illustrates a bison hunter with a slain bison and thundering herds of bison in the background. On the south side of the archway, Coronado and Padre Padilla, the Franciscan missionary, look across the Kingdom of Quivira as buzzards loom overhead. The mural's dimensions are 22 feet long and 11 1/2 feet high.